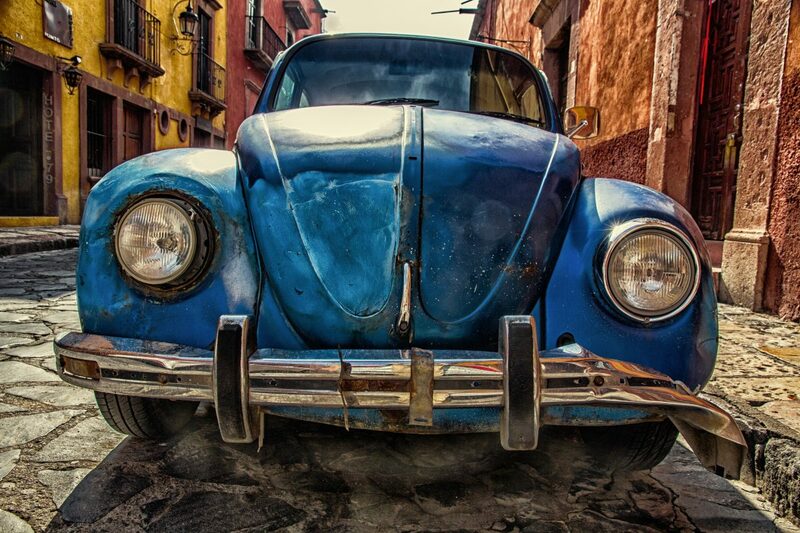 Renting a car in Mexico can seem daunting at first. There is all at once quite a lot of information out there and yet seemingly no helpful information out there. I’ve been living in Mexico for almost three years now and I have rented a car on several occasions in both the Yucatan and in Baja California. I’ve discovered several of the pitfalls and found myself in the odd situation which could have been avoided if I’d simply known about it! Why Should I Even Rent a Car in Mexico? Mexico is a huge country. If you don’t drive you usually have to rely on buses like ADO. Buses go to major places, but it’s much harder to get to smaller towns. The other way to get to these places is to hire a driver or take tours. While this is certainly possible, it’s much more expensive and restrictive than simply renting a car yourself. If you rent a car in Mexico, you have the ability to stop in smaller towns around the Yucatan, to stop in little beach towns in Baja California, to visit little towns around Guanajuato. Having a car in Mexico gives you so much more freedom and you’ll also save a ton of time! 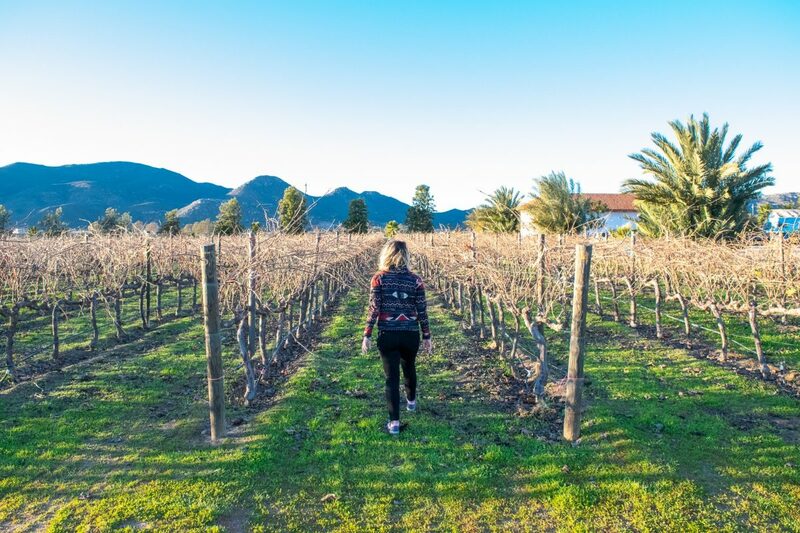 If we hadn’t rented a car in Ensenada, it would have been so much harder to explore the wine region at our leisure (instead of really quickly on a tour). Driving in Mexico can seem a little bit scary at first. Many people, including fellow expats that live in Mexico, have warned us of the “dangers” of driving in Mexico. If you plan to drive inside Mexico City, well I pretty much advise you not to. The city is incredibly congested and while it’s not really dangerous to drive in, it’s chaotic and the traffic is horrific. Unless you just want to sit bumper-to-bumper on one-way streets, then use Uber in Mexico City or even better, public transportation. Driving in Mexico outside of the major cities is pretty much just like driving in the US. They drive on the right side of the road. There are nice highways. Road signs are the same (except in Spanish of course). It really is very easy to drive in this country, so that shouldn’t dissuade you from renting a car in Mexico. 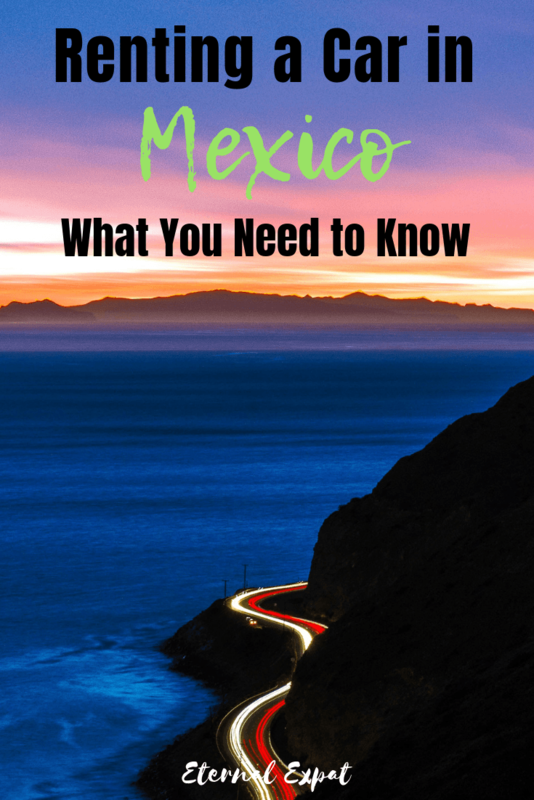 I’ve written a very comprehensive post about the do’s and don’ts of driving in Mexico which you can read here: Driving in Mexico: A Helpful Guide for First Time Visitors. 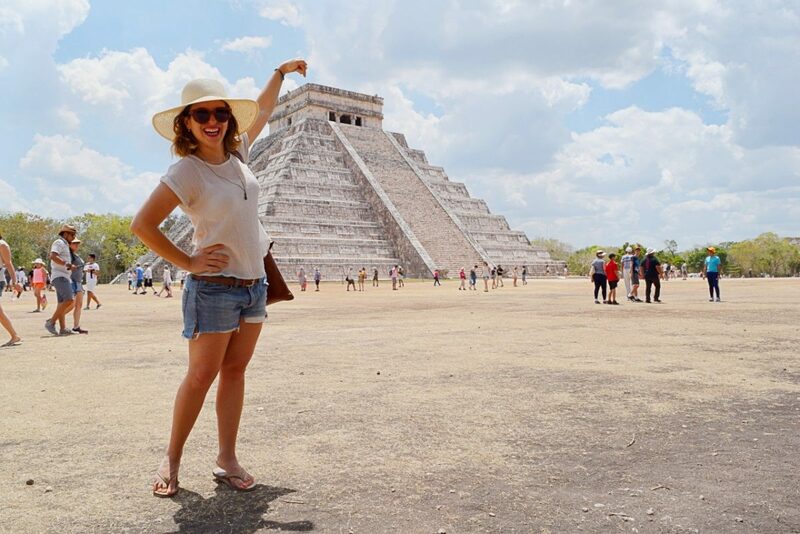 Renting a car in the Yucatan meant that we could spend ALL DAY at Chichen Itza exploring every inch of it without having to get back to the bus! I’ve used a few different rental companies here in Mexico and the ones that are my favorites are pretty much my favorite places to rent a car everywhere else in the world, too. Enterprise is consistently my favorite place to rent a car around the world. They have, by far, the best customer service. It doesn’t matter whether I rent a car in London, Cancun, or New York, I get the same fantastic service. The only thing is, well, you pay for that good service. It usually has the highest day rate of all of the rental cars. The company that consistently has the lowest rates around the world, including in Mexico, is Sixt. But I really loath their customer service. If you can look past how poor their customer service is, well, then this is the best budget option. The cars are usually pretty banged up already, so you don’t have to worry about getting a scuff or scratch on the car (there are already plenty!). Other car rental companies that are in Mexico that lie somewhere between Enterprise and Sixt are Europecar, Budget, Avis, and Hertz. All offer different prices depending on the time of year and your age. 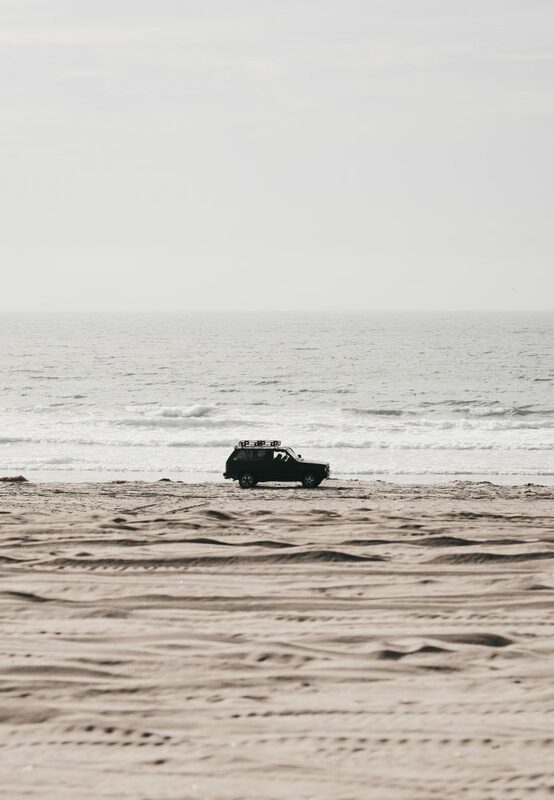 Be sure to rent a 4×4 vehicle if you want to drive along the beaches in Baja! You may be tempted to book your rental car with companies like Expedia, Rentalcars.com or another of those discount travel websites. Do not rent a car in Mexico through a third party website. While the price seems amazing, you will be slapped with an insurance fee once you arrive at the car rental desk. I have had the joy of making this mistake and it can be an expensive one. Even if you rent through somewhere like Expedia and you add the additional insurance, this will NOT be the insurance that you need to have in order to rent a car. In Mexico, you MUST have third party or what’s sometimes referred to at personal liability insurance. Mexico does not recognize any other insurance you buy through a third party like Expedia. It also does not recognize insurance that is offered to you through your credit card. It does not recognize your US car insurance. This should cost roughly $10 a day from most companies. There is also another type of insurance which you can opt for once you get to the rental car desk. This is full coverage which brings your deductible down to a much lower price. It also protects you in case of emergency and theft. I usually opt out of this simply because I’m a cheapskate. If you opt out of this insurance, the hold on your credit card will be 40,000 Mexican Pesos (about $2,000 USD). If you choose to have the insurance, the hold on your credit card will only be 8,000 Mexican Pesos (about $400 USD). In my opinion, the one and only way to rent a car in Mexico is to book directly with the rental car company. You can do this through their website or you can do it once you arrive at the airport in Mexico. Renting directly through the rental car company ensures that you only pay exactly what you need to pay and nothing more. You will be able to get the exact daily rate. This includes the required third party insurance so there won’t be any surprises when you pick up the car. If you are traveling during busy times like Easter, spring break, summer school holidays, or around the winter holiday time, then I really recommend booking in advance. In my opinion, this is how to ensure that you get the best price. If you wait until you get to the airport to book your car, then you are likely to pay a higher day rate for the insurance. 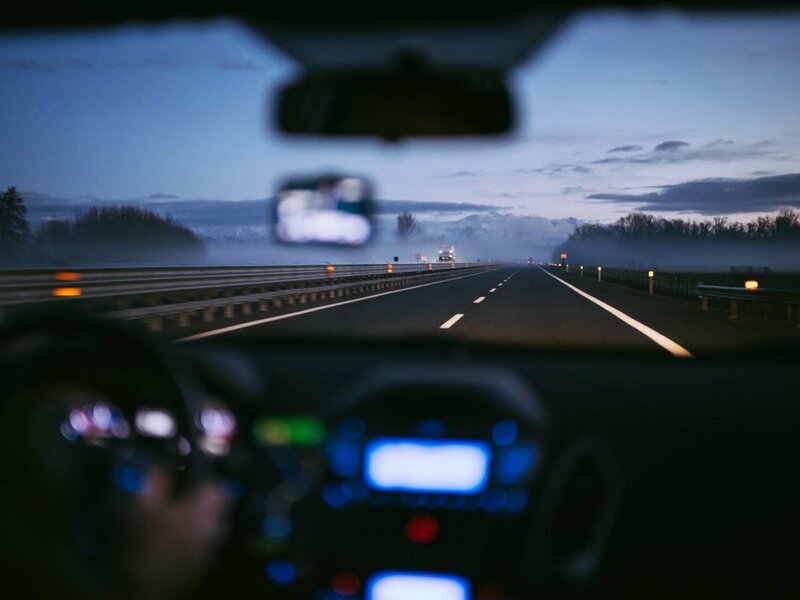 If you are traveling during low seasons, then you may be able to get a better rate by simply showing up to the airport or to the rental car office if you are renting in a downtown area. 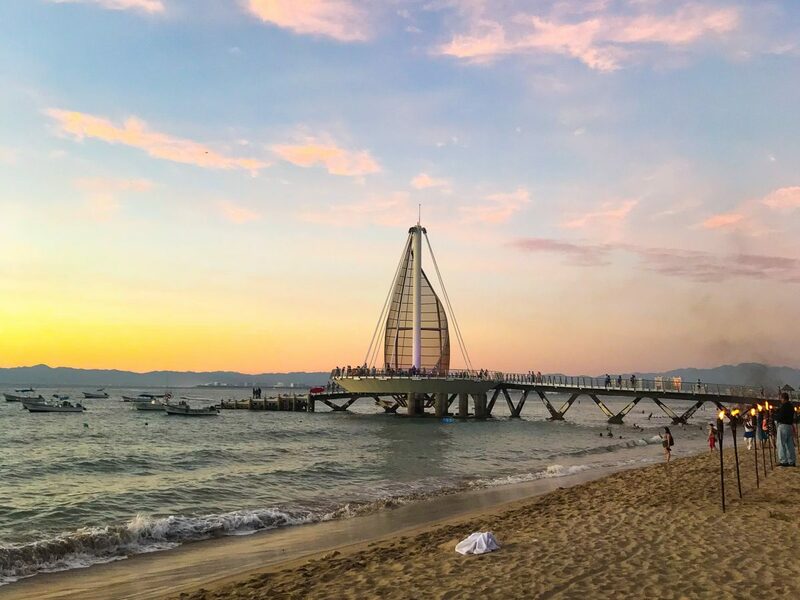 Having a car in Puerto Vallarta means that you can leave the busy Los Muertos beach and head off to quieter beaches along the coast! If You Don’t Speak Spanish? If you do not speak Spanish, then I really recommend only renting a car in Mexico from airports. Airports around the country always have at least one or two people who speak English. I recently rented a car in downtown Tijuana and no one spoke English. I was just about able to fumble my way through the Spanish to get everything sorted with the rental. Luckily, between myself and my boyfriend, we understood everything that we needed to get the car without incurring any additional fees. However, if you don’t speak Spanish, this may be nearly impossible. It’s usually not any cheaper to pick the car up in a location outside of the airport. Something that most car rental companies in Mexico neglect to tell you about driving in Mexico is that most highways around the country are toll roads. The tolls usually aren’t very expensive. In Baja, to get from Tijuana to Ensenada, you go through three tolls all of which cost about 35 Pesos ($1.50 USD). In the Yucatan, to get from Cancun to Merida, you pay several tolls which amount to over 100 Pesos. I recommend always carrying enough cash because often these tolls are in the middle of nowhere. Alternatively, some car rental companies in Mexico offer you eTags. These are electronic toll tags that allow you to use the fast-pass lane. I’ve only experienced this in the Yucatan. In other parts of Mexico I have not been able to rent a car with a tag. However, I believe you can ask for this option in Mexico City as well. Usually, you prepay for the tag and then any other fees that are owed are charged to your credit card later. Most car rental companies in Mexico default to a manual transmission. If you want to have an automatic car you have to make sure you choose that option. Also note that renting an automatic car is usually more expensive than renting a manual car since there are fewer of them around. They also know that most American tourists prefer these. You absolutely MUST have a credit card to rent a car in Mexico. I’ve rented in other countries around the world where you can sometimes use a debit card as long as the debit card has enough money for the hold, but in Mexico, it must be a credit card. Not all car companies include the second driver free. Some companies, like Sixt, charge extra for a second driver. You do not need an international driver’s license in Mexico. As long as you hold a valid license which is printed in the Roman alphabet, then you’re ok. So Chinese, Korean, Japanese, etc must have an international driver’s licenses. Most cars come with a full tank, and just like renting a car in another country, you have to bring the car back with the same amount of fuel. It’s ALWAYS more expensive to pay for them to refill it for you. There are plenty of places around airports to fill up the gas tank. Like in any country, pay attention when they inspect the car before your rental. Make sure they mark all of the dents, scratches, and cracks so that you don’t get blamed for any of the problems that already exist. Almost all car rental companies offer unlimited kilometers on your rental. That being said, it’s always worth double checking so that you don’t end up with a surprise upon returning the car.